The Church in Rwanda has not stopped grieving for the victims of the country’s 1994 genocide, according to Archbishop Antoine Kambanda of Kigali. Source: Crux. In a wide-ranging interview with The New Times, a national English language newspaper, the prelate bemoans the suffering of millions of Rwandans and the more than 800,000 Tutsis massacred in the genocide - a genocide in which many Catholic priests played a role. 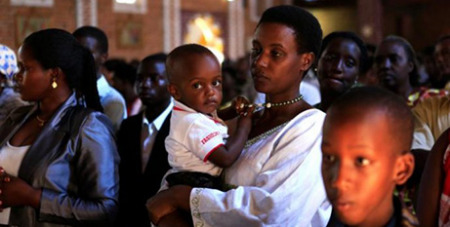 “The Catholic Church has never stopped weeping for what happened in Rwanda,” the archbishop said. “The first voice of authority to say openly that what was happening in Rwanda was genocide was Pope John Paul II, yet it took time for the UN to discuss and agree upon using the term genocide for what was happening in Rwanda,” he continued. The archbishop commented on the fact that several members of the clergy were implicated in the slaughter, even directing the killing of people seeking refuge in their churches. A report ordered by the Organisation of African Unity on the genocide concluded that members of the Church had offered significant support to the Hutu regime during the killing, and that Church leaders had played a “conspicuously scandalous role” in the genocide by failing to speak out against it. “And the position of the Church is that priests, the clergy, who were involved in the genocide, are to be tried for what they did and be held accountable. The Church does not say that because they were priests there is an exception, no, a crime is a crime. But the fact that a clergyman did that crime, it is not within the mission he was given, he abused and betrayed his mission, so it is not the Church which did it,” Archbishop Kambanda said. “However, as the son of the Church, we regret and ask pardon for that; the Pope did it and the bishops did it in the Synod, there was a long process of asking pardon to God and to the community that the Genocide caused so much (harm). The guilt and wrongs the children do, the parents take upon, several times the Church has asked pardon to God and to the community,” he said.